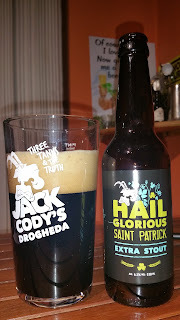 Not being Catholic, or even religious* for that matter, the name of Jack Cody's latest beer was initially lost on me. I Googled the name to see if it meant anything and sure enough, it's a hymn. The lads sent me a nice box with the beer and a new glass to sample. Feedback is important to a lot of brewers so here it is. The first thing about Hail Glorious Saint Patrick is that it's not your average extra stout like the label clearly says. In fact, they could be doing themselves a disservice. There are vanilla pods and espresso beans added in here. These are listed in the ingredients but really should be made more obvious on the front label. A Coffee and Vanilla Extra Stout is much more purchasable by beer geeks. This is a different beer to last year where they released a 5.4% imperial stout under the same name. Packaging aside, what's it like? On the nose, there's plenty of coffee and vanilla with a sweet milky thing going on. When I tasted it, I was reminded of a milk stout with hints of coffee and vanilla. I love coffee but I haven't had any in about 15 years. As such, coffee stouts aren't generally my thing. This is mainly because brewers tend to go overboard with the coffee and forget about the beer underneath. Thankfully, this beer doesn't do that. The coffee is ever present but lashings of thick, vanilla milky goodness keeps it in check. It's a little on the sweet side for my normal sensibilities but you know what? It works here in the same way that a sweet Belgian beer just works. For now, it's a limited release and looks to be priced at about €2.70 after a brief check on the Martin's website. For a 6.3% stout, that's not too bad for a limited release. I would actually love to see what this would be like if they added some oats to increase body and re-branded it as a breakfast stout. Perhaps that's something they might consider if they decided to bring it back after its initial run. In that case, simplifying the name to Glorious Breakfast Stout or something might be better. * I actually used to be very religious until I was 17 or so. I still never came across that hymn though as it's probably a Catholic thing.